Use of alternative herbicides was the main topic of discussion at the final AHDB Strategic Potato Farm field walk of the season. Graham Tomalin of VCS Agronomy discussed with the 45 agronomists attending the event, the need to consider a range of strategies when considering alternative solutions to using Diquat, if it is banned. 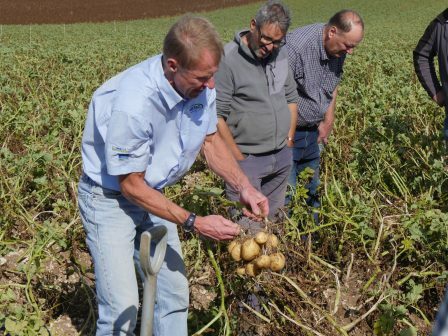 He showed how 26 varieties of potatoes planted for a herbicide trial at Somerby Top Farm, North Lincolnshire, reacted to the use of different combinations of desiccant agrochemicals, and provided insight into alternative strategies growers could use. Graham said that if Diquat is banned, flailing will become more important with immature crops and indeterminate varieties. He discussed how with canopies that are senescing, the alternatives will desiccate most varieties but this may take longer. Currently approved alternatives are better targeted to stems and are less effective on leaves than Diquat. Graham stressed that application quality is vital to achieving the best results from any desiccant application. Coverage is very important and a combination of a slower forward speed of the sprayer, water volume and angled nozzles may all improve this. Amber Cottingham, AHDB Knowledge Exchange Manager for the East Midlands told the attendees that AHDB is viewing the loss of Diquat as a priority, which is why looking at alternatives during this trial was so important. She said: “It’s vital we explore and trial the alternatives. We all know that a good burn down of crops is vital to ensure adequate skin set for harvest, this can be difficult without Diquat. This could risk potatoes being damaged at harvest leaving them exposed to infection during storage. Later at the event, Dr Mark Stalham of NIAB CUF reflected on how yields might be affected by the driest season on record. He said that irrigated crops stand a very good chance of being high-yielding and if hot seasons become more commonplace, irrigation frequency will be the key to high yields.